This gourmet Easter basket has what children want, toys of substance, and great candies and cookies, unlike the dime-store basket with more fluff than stuff! 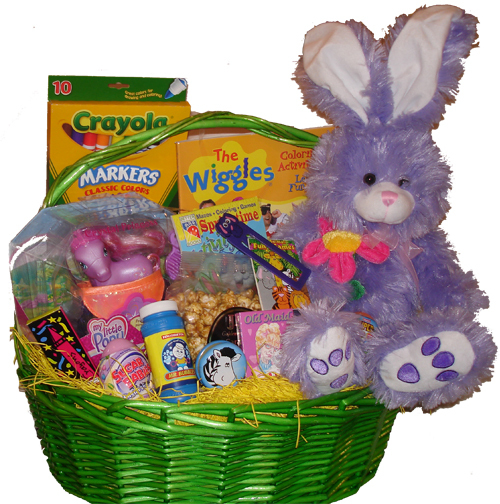 Extra large pastel basket with over-sized bunny, popular kids toy (Pictured is My Little Pony. All toys and games will vary based on gender and availability), Wiggles activity book, Easter coloring and activity book, crayons, markers, animal game, animal book mark, extra large candy eggs, bubbles, yoyo, a paddleball, children’s card game, and caramel popcorn Items not pictured, placed at rear of basket are chocolate candies (gourmet and popular candies), chocolate chip cookies, brown-sugar cookies, Tootsie Rolls, jelly beans, a chocolate bunny, and a pail of cotton candy. This gourmet Easter basket has what children want, toys of substance, and great candies and cookies, unlike the dime-store basket with more fluff than stuff! We created this gift basket so that my six-year old twins get more than just a toy they’ll immediately break.